Peter Hutton has been named Derry City manager for the remainder of this season following the exit of previous boss Roddy Collins on Sunday. 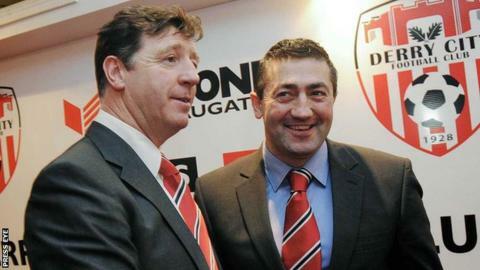 Hutton was Collins's assistant during the Dubliner's brief seven-month reign at the Brandywell. Former Derry favourite Hutton was named caretaker boss on Sunday and was installed until the end of this season by the club's board on Tuesday evening. Hutton, 41, managed Finn Harps for 18 months before resigning in October. The former Derry player has performed a caretaker Brandywell role on two previous occasions but this will be the first time that he will take on the job for a significant duration. Marty McCann, the club's first-team coach during Collins's reign, will serve as Hutton's assistant. Hutton holds the record for most appearances for Derry City having turned out over 600 times for the Candystripes. The Derry man won League of Ireland medals with his home town club and Shelbourne and also had spells at Irish League outfits Portadown and Cliftonville. Hutton did not attend Friday's home defeat by Shamrock Rovers which led to speculation of a falling out with Collins. Friday's home defeat left Derry in seventh position in the 12-team table, 12 points behind leaders St Pat's and only two points above the relegation play-off spot.